Born: 16 May 1865, Tiverton, Devon, England. Died: 18 May 1941, London, England. 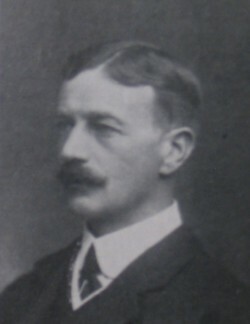 H. Marshall Hole, son of Charles Marshall Hole, was educated at Tiverton and at Baliol College, Oxford, where he qualified as Bachelor of Arts (BA). In 1890 he married Ethel Rickman, with whom he had one daughter. That same year he joined the service of the British South Africa Company. He came to Mashonaland (now part of Zimbabwe) in 1891 as secretary to the administrator, Dr L.S. Jameson, and subsequently occupied various posts in the Rhodesian civil service. During the Mashonaland rebellion in 1895 he served as a lieutenant in the Rhodesia Horse and was awarded a medal. During the Anglo-Boer War (1899-1902) he served as a captain in the Southern Rhodesia Volunteers and received a medal with clasps. At the beginning of the war, while Government Secretary for Matabeleland, small coins became scarce and he introduced the use of postage stamps as currency. In 1901 he was sent to the Middle East in connection with the recruitment of labourers and in 1909 and 1911 on similar missions to Malawi and Mozambique. From 1901 to 1908 he was civil commissioner and government representative in Bulawayo, but in 1903-1904 and 1907 acted as administrator of north-west Rhodesia (now part of Zambia). In 1908 he served on the Southern Rhodesia Education Committee and wrote its report. In 1911 he was the director of census and compiled the Report of the director of census regarding the census taken on 7th May 1911 (Salisbury, 1912). He retired from government service in 1913, but returned from May to November 1914 as secretary to the Native Reserves Commission. Hole was a member of the Rhodesia Scientific Association and served as its president for 1906/7 and 1907/8. He published one ornithological paper in the society's Proceedings, on "Some interesting birds of the Zambesi valley" (1905, Vol. 5, Part 3). Other papers by him dealt with "The Batonga and Batshukulumbwi tribes, from notes made by Farrar and Gielgud" (1905, Vol. 5, Part 2), "Portuguese exploration in Southern Rhodesia" (1906, Vol. 6, Part 2), and "The rise of the Matabele" (1912-1913, Vol. 12, pp. 91-103). Around 1908 he was president also of the Devonian Society of Rhodesia. Upon his return to England during World War I (1914-1918) he was appointed Brigade-Major in the Norfolk and Suffolk Infantry, a position which he held to 1919. In that year he took up a position with the British South Africa Company in London. In 1924 he was honoured as a Companion of the Order of St Michael and St George (CMG). Later in life he wrote several popular books on the history and development of Rhodesia, all of which were published in London: The making of Rhodesia (1926), Old Rhodesian days (1928), Lobengula (1929), The Jameson Raid (1930), The passing of the black kings (1932), and Looking life over (1934). Rhodesia Scientific Association. Proceedings, 1906-7, Vol. 6-7; 1912-1913, Vol. 12; 1930-1931, Vol. 30 (pp. 53-58, List of papers, 1899-1931). South African who's who, 1908, 1919/20, 1923/4, 1939.